In a earlier post, I summarized a project we are running together with The University of Akron, GE Global Research Center, and the Argentinean Atomic Energy Committee (Comisión Nacional de Energía Atómica in spanish). In this project we are evaluating the use of critical potentials to define seawater resistance of low and high alloy stainless steels as well as nickel alloys. Based on some questions I received over the last few weeks, I find instructive to clarify some fundamental localized corrosion concepts that might not be clear to everyone. The work by Wilde and Williams 1 and later by Wilde 2 are perhaps the first two mentions to the use of critical potentials to determine localized corrosion (i.e. pitting and crevice corrosion) susceptibility. To give you a historical perspective, these two publications pre-date Galvele's localized acidification mechanism 3 and Chao, Lin, and Macdonald's point defect model 4. If you have not read these publications, I certainly encourage you to do so. One of Wilde and Williams most important findings is that pitting and repassivation potentials (EP and ERP, respectively) are not unique materials properties. ERP relates only to the conditions necessary to re-passivate a growing pit after a specified period of propagation (referred to as prior pit growth). As a result, ERP is a strong function of the current density at scan reversal, Figure 1. Figure 1. ERP as a function of current density at scan reversal. UNS S43000 exposed to deaerated 1M NaCl at 25 ℃. Specimen area 5 cm2. After Wilde 2. Figure 2 shows that ERP is also greatly affected by the potential (or current) scan rate of the test. 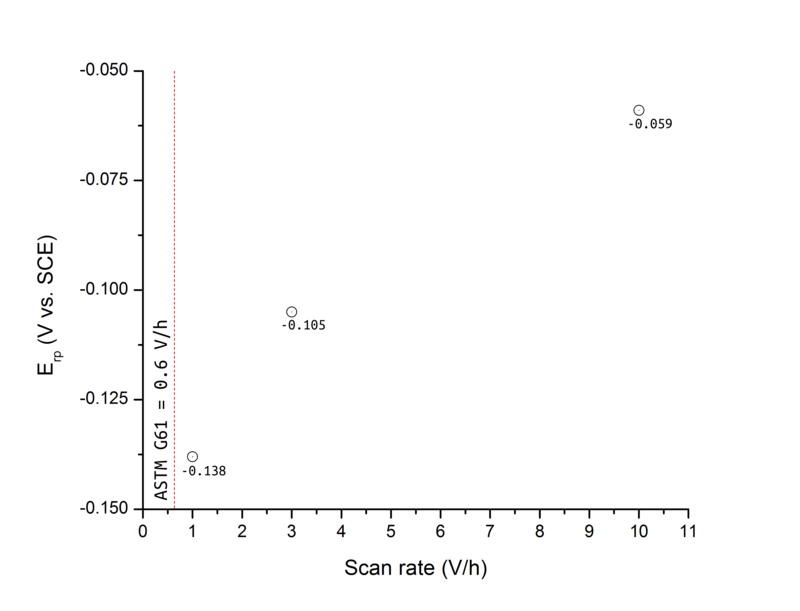 A difference of over 200 mV was found by Wilde when the scan rate was increased by a decade from 1 to 10 V/h. 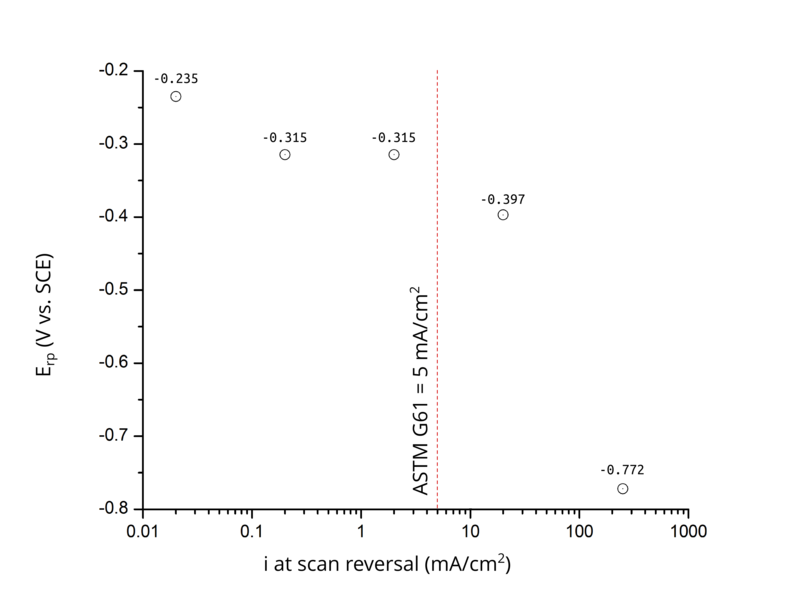 Today, for example, the ASTM G61 standard specifies a scan rate of 0.6 V/h and a current density at scan reversal of 5 mA/cm2. According to Wilde, given that crevices are always present in any engineering structure, pitting potentials, although related to the conditions that lead to passivity breakdown and pit propagation, are of little technological importance. We now know that the presence of occluded regions leads to the formation of a critical environment inside the gap before a critical pH is reached inside metastable pits. The localized acidification model will be the subject of another post. It may seem a priori that ERP values as obtained by the cyclic potentiodynamic method cannot be used to estimate localized corrosion resistance. However, Wilde and Williams also observed a clear linear relationship between the hysteresis loop of anodic polarization curves on flat specimens (i.e. 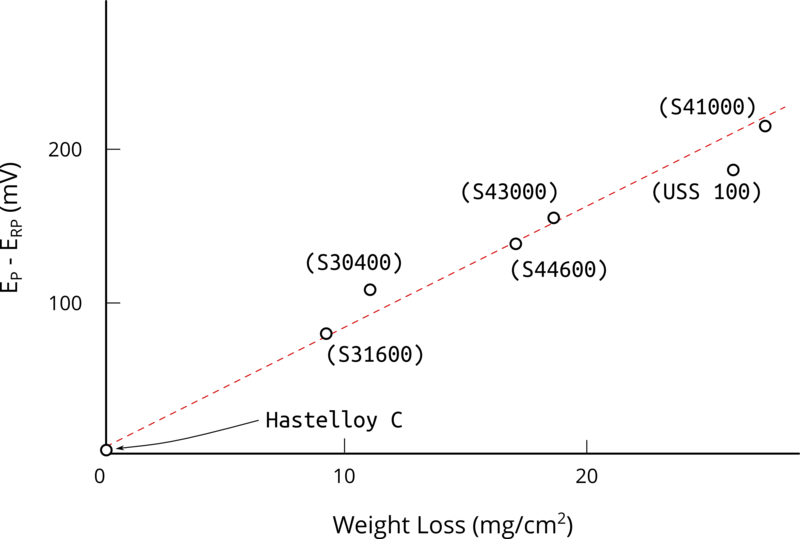 EP - ERP) and the weight loss of creviced samples exposed to natural seawater for 4.25 years, Figure 3. Figure 3. Correlation between difference potential (Ep - Erp) and corrosion weight loss of several stainless steels exposed to seawater for 4.25 years. After Wilde 2. It is this correlation what has allowed researches to use anodic cyclic potentiodynamic polarization (CPP) curves on flat specimens to estimate the susceptibility of an alloy to crevice corrosion. This correlation can be explained by visualizing a growing pit as a special case of a growing crevice after initiation. Despite the empirical correlation between the hysteresis of an anodic CPP plot and the long-term weight loss of creviced samples, the use of ERP to gauge localized corrosion susceptibility remains controversial given ERP dependence with scan rate and extent of prior pit growth. Cragnolino et al. 5 later found that, for certain systems (i.e. UNS N08825 and UNS S31603), a lower bound ERP value exists, suggesting that ERP could be a good estimator of localized corrosion performance, Figure 4. Sridhar and Cragnolino 6 suggested that ERP becomes independent of prior pit growth for deep pits. Deep pits were associated with a minimum charge density of 10 C/cm2. Thus, it is necessary to both integrate "i vs. time" data and to confirm the presence of pits when analyzing CPP results to assure that the deep pit condition was met. Figure 4. Repassivation potential as a function of pit depth. Alloy UNS N08825 in 1000 ppm Cl- at 90 ℃. Adapted from 5. Highly corrosion resistant alloys such as super duplex stainless steels (e.g. UNS S32750 and S327560), type 6Mo alloys (e.g. UNS S31254), and most high-Ni and Mo alloys (e.g. UNS N06625 and UNS N10276), do not suffer pitting corrosion at room temperature during the forward scan, leading to virtually no hysteresis loop, Figure 5. These type of alloys exhibit, in contrast, a transpassive behavior. Figure 5. 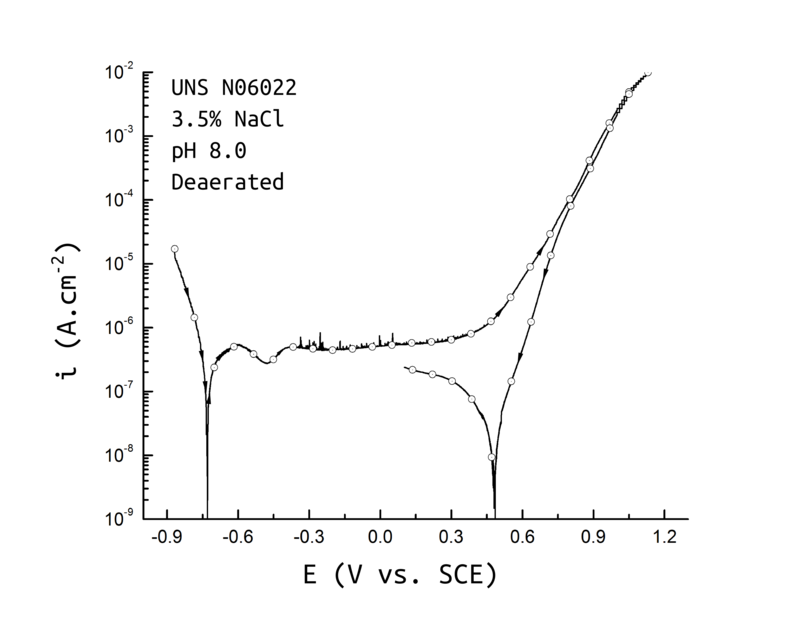 UNS N06022 anodic cyclic potentiodynamic polarization in 3.5% NaCl at 25 ℃ pH 8.0. Test according to ASTM G61. Current at scan reversal: 10 mA/cm2. During transpassivity, the chromium in the passive film is oxidized from +3 to +6, which is also typically followed by oxygen evolution from the oxidation of water. The question, therefore, is whether these type of alloys can suffer crevice corrosion in service even though no hysteresis loop is found during ASTM G61 testing. We will explore this on a future post. You may be wondering if there is a critical potential that is a real materials property. Some authors argue that the pitting potential as measured by the scratch tests is the "true pitting" potential. During the scratch test a sample is held potentiostatically and subsequently scratched using a very sharp diamond tip. A potentiostat records the current response before, during, and after scratching. If the sample repassivates, the potential is increased (i.e. moved in the anodic direction) by a given amount and the process repeated. The minimum pitting potential is, then, the potential at which repassivation of the scratch does not occur. This test will be covered in much more detail in a later post. B.E. Wilde and E. Williams, Electrochim. Acta 16, (1971):p1971–1985. B.E. Wilde, Corrosion 28, (1972): p.283–291. J. Galvele, J. Electrochem. Soc. 123, (1976): p.464–474. C. Y. Chao, L. F. Lin, D. D. Macdonald, J. Electrochem. Soc. 128, (1981): p.1187–1194. D. Dunn, G. Cragnolino, N. Sridhar, Corrosion 56, (2000):p. 90–104. N. Sridhar, G.A. Cragnolino, Corrosion 49, (1993):p. 885–894.